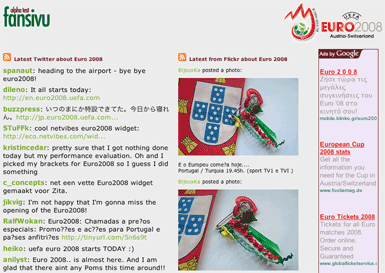 Euro 2008 Chipwrapper isn't the only footie related website I've been working on getting launched in time for this evening's kick-off between Switzerland and the Czech Republic. 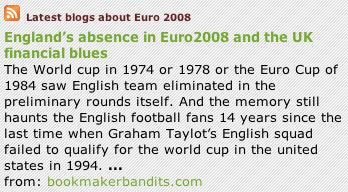 I've also made Euro 2008 Fansivu. 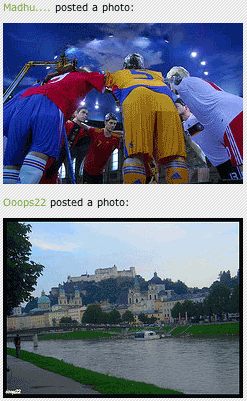 It gathers together comments from Twitter, new blog posts, and photos from Flickr that mention the tournament. They are all available on one page, or you can subscribe to a feed of each different type of content. The different content types update on different frequencies. Blog posts should refresh every ten minutes, Flickr photos every 3 minutes, and the Twitter posts should appear every minute. Although judging from the Champions League Final, I expect Twitter to fall over during most of the matches, so hopefully my graceful 'fail' will work better than theirs. It is the usual drill with one of my prototypes - everything has been built using freely available tools, in this case Twitter, Tweetscan, Ice Rocket, Google Blog Search, Flickr, Yahoo! Pipes and Feedburner. I've then glued it together with my beginner's Perl - which is why it will almost certainly break during the course of the tournament due to unexpected character encodings or something. It was inspired by a conversation I had with Robin Hamman. We had been discussing his excellent initiative to try and scan user-generated content for eyewitness reports of explosions and bombs using Yahoo! Pipes and a bit of web 2.0 elbow grease. We met up (one of the positive outcomes of using Twitter for a month) to discuss how you could take it further, and came out with lots of ideas, one of which was that where you had specific events with structured data, you could build a framework to harvest the content intelligently. My initially over-ambitious scope for the project was for it to be conscious of when matches were on, and who was playing, in order to give more weight to certain types of content at certain times - e.g. ping Twitter every minute during match-times, and only every half hour in the middle of the night, that sort of thing. Another thing I would have liked to have achieved with it was a way of taking snap-shots, so that you could go back to see what the comments and photos had been during a particular match. Still, as a proof-of-concept it seems to be doing the trick so far - and I'm really interested to see how it develops during the course of the opening fixtures tonight. By Martin Belam on 7 June 2008.